How Much Compensation Can I Claim For A Hairdresser Injury? A trip to the hairdresser is fairly routine. A regular feature of many people’s lives, a haircut in a salon, barber’s, or another venue might seem inconsequential. Indeed, there are roughly 40,000 hairdressing businesses of all sorts around the UK, according to figures released by the National Hairdressers Federation. But accidents can happen. If you have been injured or harmed during an appointment, then enquiring with a legal professional about hairdressing compensation claims could be hugely beneficial. In many situations, hair damage claims can be the best way to repair the damage stemming from an accident. This could be financial, medical, personal, or psychological. In this guide, we will examine the various hairdressing compensation claims that have resulted from cases of hair salon negligence and more. A guide to hairdresser compensation claims. What to do if you are injured by a hairdresser. How to begin a hairdresser compensation claim. Who is liable for an injury sustained in a hair salon? Can I claim for damage to my hair? Health and safety legislation for hair salon operators. What can be claimed for as hairdresser compensation? How much compensation will I get for an injury caused by a hairdresser? No win no fee hairdresser compensation claims. Why choose us as your claims service for a hairdresser compensation claim? Incidents involving hairdressers are not uncommon. Many of these incidents might be relatively minor, the result of a sharp object being used in a rushed manner. Small cuts caused by scissors, for instance, will usually heal within a number of days. But hairdressing venues can potentially harm clients in a number of different ways. The use of chemicals during certain procedures, the use of electrical equipment, and the use of very hot objects can lead to injuries of a more serious nature. In situations such as these, people’s thoughts quickly turn to hairdresser compensation. In this guide, we will discuss a variety of different factors common to the majority of hairdressing compensation claims. This will include a discussion of the various types of injuries, recommended courses of action, liability for injury, and potential settlement amounts. If you are considering legal action or suing a hairstylist, then this information could prove essential. Finally, we will also discuss the process (and benefits of) hiring a professional law firm to represent your case. Keeping Records: before you move forward with a compensation claim, it is important that you gather evidence of your claim. Part of this stage is being sure to keep any records relating to the accident. This can be appointment cards, emails, phone records, or similar. This information can be used to corroborate your story and ratify your version of events. Taking Notes: when preparing hairdressing compensation claims, one of the first pieces of information you will be asked to present will be the details of the organisation you wish to make a claim against. It might be either the individual hairdresser or the business itself. This will differ on a case by case basis. Some hairdressers work in a self-employed or freelance capacity, while others are employed by the business. Find out as much information as you can about the people and businesses involved in your case and have this information to hand. Seek Medical Help: we advise that clients seek medical attention as a first priority. However, this does not end after one appointment. Your ongoing medical care can form an important part of the claim. Asking your doctor about long-term health implications of an accident can be important and you may wish to gather doctor’s notes, prescriptions, and x-rays (if any of these are available) as part of your gathering of evidence. Contact a Legal Professional: once you have this information, it can help to have a professional opinion on the matter. Making hairdressing compensation claims can be complicated. Thankfully, you do not need a specialised team of hair lawyers to assist you. Our compensation claims team will likely be better informed and will possess many years experience in the field. If you would like to consider legal action, then taking advantage of our free legal consultation can be an important first step. Your actions following an accident can have a big influence on any potential claim you make. If you are interested in legal action, the next section will detail the first steps you should take. Hairdressing compensation claims are rarely simple. In addition to a large amount of paperwork and administrative duties, even knowing when and where to begin can be tough. Even a small claims court hairdresser claim can be complex. This is why we recommend that people turn to a law firm. Legal professionals can ensure that you have all of the required information and evidence when presenting a case. If you would like to learn more, our free legal consultancy can easily be arranged. After you have suffered a hair-related accident, your mind might be full of questions. You might find yourself asking, “can you sue a hairdresser for a bad haircut?” or frantically searching the internet with phrases such as, “my hair stylist fried my hair.” However, this information – and anything related to hairdressing compensation claims – can be found with one simple phone call. If you do choose to arrange a consultation session with us, then we can provide you with a wealth of informed, experienced information. For instance, we can take a look at any information you have gathered already. We have plenty of experience with hairdressing compensation claims, as well as compensation cases of all sorts. We can examine the evidence and tell you the likelihood of you winning compensation. If we believe that you have a case, we can take a few steps. We can arrange for you to meet with a local doctor, who will provide a full medical evaluation and report on the lasting consequences of your accident. We can gather further evidence, potentially including CCTV footage. We can even operate on a ‘No Win No Fee’ basis, dramatically reducing the costs you pay before the case is settled. We will delve deeper into this matter later in the guide. But for those who are wondering about how to begin a claim, a quick call to our claims team can be the best place to get started. Allergic Reactions: due to the various chemicals used during some hair procedures, clients can have allergic reactions to various different products. Poor or Insufficient Training: training and education in the various hair-related disciplines are important. With complex equipment, various chemicals, and many sharp objects, properly trained hairdressers are expected to know how to avoid injuring their clients. Slippery Floors: floors and surfaces will need to be kept clean throughout the day. Spillages and even the cleaning itself can lead to people slipping and falling on the property. If this slippery area is not correctly signposted, then there may be a case for negligence. Contaminated or Unsanitary Instruments: the equipment used during appointments should be clean. If unsanitary or contaminated equipment is used, it might pass on an infection. If this is the case, then the client might be due compensation. Burns and Cuts: the chemicals used by the hairdresser may lead to burns, either of your hair or your skin. In addition, cuts from blades, scissors, and other sharp objects are also common. Such injuries can vary in severity. Hair Damage or Losses: it is possible for a client’s hair to get damaged through the use of the wrong products or incorrect use of the right products. Hairdressing compensation claims can also be made for hair damage or losses caused by the negligence of your hairstylist. There are many ways in which you might have been harmed during a hairdressing appointment. If any of the above injuries were suffered by you (or any other type of injury), then a compensation claim might be necessary. Slip and Trips: if you sustained injuries from a slip or trip at the salon – particularly if the floor was cluttered, wet, or contaminated – the salon can be held liable. They are considered to have a responsibility to either keep floors clean and free of hazards or to signpost said hazards during the cleaning process. If they fail on either count, then the salon (or any other business) might be liable. Accidental Injury: if you were burned or cut by the stylists due to their own carelessness or because they were not properly trained to use the tool or equipment properly, compensation from hairdresser or salon appointments will likely depend on the specific employment contract of the individual. They might be self-employed, freelancing, sub-contracting, or employed by the salon. Depending on their status and their respective insurance policy, your claim may be directed at different parties. Chemical Burns: matters involving chemicals can often be categorised in a similar manner to accidental injuries. Often, the employment status of the individual will be of some consequence. In addition, their training and education on the matter may be called into question. Should they work for a business, for instance, that business may be responsible for their training with the chemical products and, thus, could be liable for the injury. Faulty Equipment: instances in which an accident has been caused by faulty equipment can be slightly different. Depending on how well the equipment was maintained and inspected, and whether the error was due to a manufacturing fault, the liability could belong to either the business owner or the equipment manufacturer. Trying to determine liability can be one of the most difficult parts of any compensation claim. If you are at all confused, discussing the matter with a professional can be very helpful. Balding: The use of wrong or dangerous products on your hair may cause bald patches or cause your hair to start falling out after cells become damaged. It is possible to file hairdressing compensation claims when balding has been caused by an accident. Scalp Dermatitis: Scalp dermatitis is a skin condition that causes stubborn dandruff, as well as red and scaly patches to appear on your scalp. The infection can also affect other parts of your body. Scalp dermatitis can be caused by overexposure or treating the scalp with harmful chemicals. It can also be caused by a hairstylist using highly caustic chemicals on a client’s hair. Burned Hair or Scalp: If a styling procedure or faulty (or incorrectly used) equipment causes your scalp or hair to get burned, you may be able to make a claim. Such cases can find the equipment manufacturer, the individual, or the business liable for compensation. Brittle Hair: The incorrect use of chemicals and equipment can cause your hair to become thin and brittle, potentially resulting in a loss of hair. 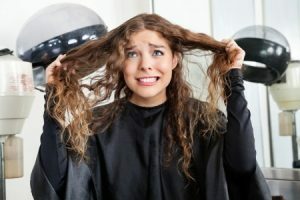 If the brittle nature of the hair can be proved to have been caused during an appointment, you may have a case for legal action. Patchiness: Patchiness, including bald patches or uneven cuts, can be aesthetically displeasing. In certain situations, this may mean you have a case for compensation. Psychological Damages: It is possible to claim for compensation for the psychological and emotional damages that the loss of your hair may have caused you. Hair loss and damages can cause a great deal of embarrassment and social anxiety. This can become particularly taxing and can damage your mental health. Even if the particular circumstances of your case do not appear in the above list, it does not mean that you do not have a claim. To find out more, contact our team today. 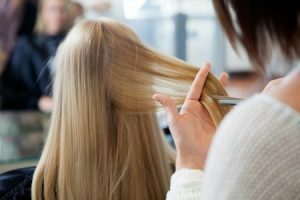 Employees Must Conduct Patch Testing for Hair Colouring Products: the law requires that hair strand tests must be carried out before hair colouring products are applied to a client’s hair. This is designed to ensure that it is the right colour and that the chemicals contained in the dye do not cause allergic reactions or damage the client’s hair. This is mandatory, even for organic hair dyes. Hair Stylists Must Be Properly Trained and Instructed: Salons owe a duty of care to their clients to ensure that the stylists they employ to work on clients hair are skilled and competent professionals. Stylists should possess information – such as knowing the right time to remove products from a client’s hair, so as to prevent damage to the hair and scalp – and they should understand how to take safety precautions to protect the clients. Proper Disposal of Products: The Control of Substances Hazardous to Health Regulations (COSHH) Act from 2002 regulates the way in which salons use, store, and dispose of chemical solutions such as perming lotions, peroxide powders, and other chemicals. These substances can be hazardous to the environment if they are not disposed of correctly. Regular Testing of Electrical Appliances: Salons are also expected to conduct regular testing and maintenance of their electrical appliances and gadgets, as stipulated by the Provision and Use of Work Equipment Regulations Act of 1998. If any of the above guidelines are not implemented or adhered to, then you may have a claim for compensation. General damages – a broad term encompassing much of the pain and suffering which has stemmed from the injury or accident. This could include the impact it has had on your everyday life and any reputation you might have lost as a result of the incident. Special damages – these damages are more measurable, as they can include the lost wages, fees you have paid for nurses or carers in the home, and damage to your property (such as your clothes or car) that have resulted from the accident. Medical costs – medical costs caused by a hairdressing accident can include the cost of private health care, specialist equipment required, or any other form of treatment which has cost you money. Travel costs – this can include the cost of travelling back and forth from your doctors and any other travel which you might have needed in the wake of the accident. Putting together a final settlement total will involve evaluating all of the various ways in which the accident has affected you. Compensation is awarded only after taking multiple factors into consideration. The main factors include the type and severity of the injury, as well as extent of the negligence and any foreseeable negative implications. Because of this, it’s almost impossible to give a correct prediction of the exact amount you will receive as compensation. Our lawyers would be able to provide a more nuanced estimation during your free consultation session but, in the meantime, this table can illustrate the difference between severe and more moderate injuries involving hair loss. For an estimation based on the details of your case, get in touch with our team today. We offer clients a ‘No Win No Fee’ policy. Such an arrangement has many advantages. If you are considering legal action, for example, one of the biggest challenges can be hiring legal professionals to help you. Often, they will require money to be paid either upfront or during the case. If you are suffering from a health problem due to your accident, then this can be particularly difficult. However, our approach is different. Hiring our team does not cost you anything until the case is won. Even then, we will simply take a cut of the compensation settlement. This is a simple and effective way with which to fund a compensation claim. As well as this, we only charge you a fee if your case is successful. This greatly reduces the risk involved in pursuing a claim. A free legal consultation at a time which suits you. A medical evaluation with a local doctor, arranged by us. A ‘No Win No Fee’ policy which reduces financial risk. A huge history of legal expertise and knowledge. Hiring our legal team can transform your case. We can make claiming compensation a simple, stress-free process. If you have had a problem with your hairdresser or any form of hair-related accident and would like to make a claim, we are ready to help. If you would like to make a claim and want to hire the best legal team in the business, there are two ways of contacting us. First, you can go to our website and fill out the contact form. Second, you can call 0800 073 8804 and chat to one of our representatives today. If you want the best legal care, call now and discover what we can do for you. Claim Compensation For a Slip Trip Or Fall Injury. If you have suffered a slip trip or fall at a hairdressers or Salon contact us today. In the UK up to 70 per cent of hairdressers suffer from work-related skin damage such as dermatiti. Burn Injury Compensation Claims – How Much Compensation. Have you suffered a burn in a hairdressers? claim compensation today for your burn injury.